At Present, ceramic tiles and grout are more used in kitchens, bathrooms, bedrooms and dining rooms than anywhere else inside a house. Being the most important rooms inside your home, we understand how clean and maintained they should be at all times. Desert Tile and Grout is committed to restoring them back so you can impress your visitors again. With just a quick call, we will set up a suitable time for you to receive our top-notch restoration service. We are known for our fast responses, so don’t hesitate in contacting us for more information about our restoration services. We are known to be the best tile and grout restoration and cleaning company in Scottsdale and surrounding areas. We provide a high-quality, affordable restoration services for every floor tile made out of ceramic, marble, travertine, brick, and more. If your flooring tiles start to lose their color, Desert Tile and Grout will restore it back, while thoroughly cleaning every tile and making them more durable to everyday use. We show our commitment with our 5-star reviews on Yelp, Angie’s List, Google Maps, and A+ in Better Business Bureau. With our restoration services, we can add 5 or 10 years to your tile’s lifespan, and after that, you should only apply a basic cleaning regularly to your flooring tiles. For more information about our services, you can reach us at 480-288-4475. We have decades of experiences, so we assure you we know everything about Scottsdale restoration services. Ceramic tile is one of the staples of southwestern decor. Desert Tile and Grout Care’s Scottsdale ceramic tile and grout cleaning service helps to keep these tiles looking their best. As ceramic tiles age they can become scratched and dingy and the grout becomes stained and dirty. Our ceramic tile and grout cleaning in Scottsdale Arizona can deep clean your ceramic tiles and color seal your grout bringing back its original beauty and sealing the grout against dirt and spills. Let the experts at Desert Tile & Grout Care help restore the splendor of your ceramic tiles and grout. If your Scottsdale ceramic tile floors need a quality clean or restoration, our company can give your floors the quality look and feel it deserves. Contact our experts today to learn more about ceramic tile & grout cleaning and sealing tile services for your home or business. You can reach our office at 480-288-4475 to schedule an appointment and have our professionals give you a free estimate estimate for your ceramic tile floors. Our experts also provide tile cleaning services for Scottsdale Saltillo floors! You may have noticed that cleaning grout is much more demanding than keeping your ceramic tile clean. Desert Tile and Grout Care offers Scottsdale Grout Cleaning Services. We can get even the toughest stains out of your grout. Grout stains easily because it is so porous and absorbs color, dirt and other harmful substances. A professional grout cleaning can lift those stains out from your grout. Every cleaning should be followed by a sealing to ensure your grout stays beautiful for a long time. After we have extracted the dirt from your Scottsdale grout, we apply a penetrating sealant to protect the grout from future damage and staining. Additionally, we are also experts in restoring grout that has been damaged by harsh cleaners, settling foundations that cause the grout to pop out of the floor or poorly installed grout. No matter what problem your grout is experiencing, we can fix it, clean and then seal it to ensure it will last you for years to come. Ask us how! For quality floor cleaning services in the North Scottsdale areas of 85255, 85259, 85260 and more, Desert Tile & Grout Care can help. When you need professional tile and grout cleaning services in the McCormick & Gainey Ranch areas of 85258, 85250, and 85256, trust Desert Tile & Grout Care. For high quality tile and grout cleaning on all kinds of surfaces in the Downtown and Old Town Scottsdale areas of 85251 and 85257, consult Desert Tile & Grout Care. 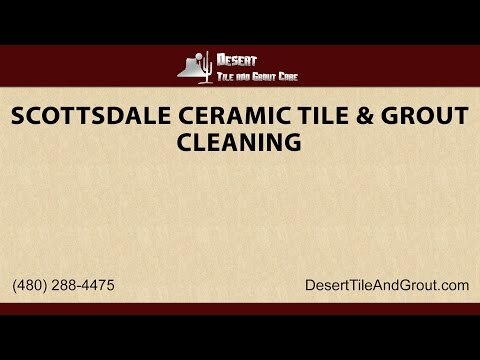 If your Scottsdale tile is dirty or you are simply tired of how it looks, contact Desert Tile and Grout Care today. We can clean your grout, seal it to keep it from staining. Bathroom tile benefit from a sealing, because it prevents mold and mildew from settling in the grout. No matter if you have stained kitchen grout, moldy bathroom grout or cracked grout on your patio, we have the solutions! Also, ask us about our grout staining service that will give your grout and tile floor a completely new look. We provide beautiful Scottsdale Marble floor restoration services that will make your home look better than ever. Just tell us when and where to go and we will be there to provide our top-notch restoration services. This type of Scottsdale flooring tiles usually comes in light colors, complementing your kitchen or your bathroom. If not maintained, the grout can turn darker and the tiles unattractive. Get in touch with us if you need a restoration service to thoroughly clean them and make them more durable. You should choose our Scottsdale ceramic floor restoration service if you want your tiles to have their precious look back. If you see your ceramic tiles fading and losing their color, we are more than capable of bringing back their color while making them more durable than before. Nowadays, Scottsdale brick tiles are not only used to build walls, you can find them on house entrances and floors. These can also appear in both residential and commercial areas. Scottsdale brick tiles generally come in different shades of red, brown, and other earth colors. Whenever you need a fast maintenance or cleaning on your brick tiles and don’t have the time for it yourself, you can count on us. Scottsdale Arizona is one of the most attractive and diverse cities in the United States. Scottsdale considers itself among the most “western” cities in the country and works hard to preserve its authentic western heritage with stores like Saba’s Western Wear and attractions like Rawhide Western Town. Yet Scottsdale is also known as one of the top 10 markets for luxury homes in the country. Scottsdale has a large cultural district, rich with art galleries. In addition Scottsdale offers shopping at the Fashion Square Mall, or specialty malls like the Borgata of Scottsdale and the Hilton Village. In addition to a sparkling nightlife replete with nightclubs and fine dining Scottsdale also boasts over 200 golf courses. These golf courses are home to some of the most beautiful scenery in the world, set in the red rocks of Sedona and the tall cactus of the desert, while surrounded by mountain ranges. Scottsdale is a true southwestern town decorated in tile floors and mosaic designs of Kokopelli and lizards.